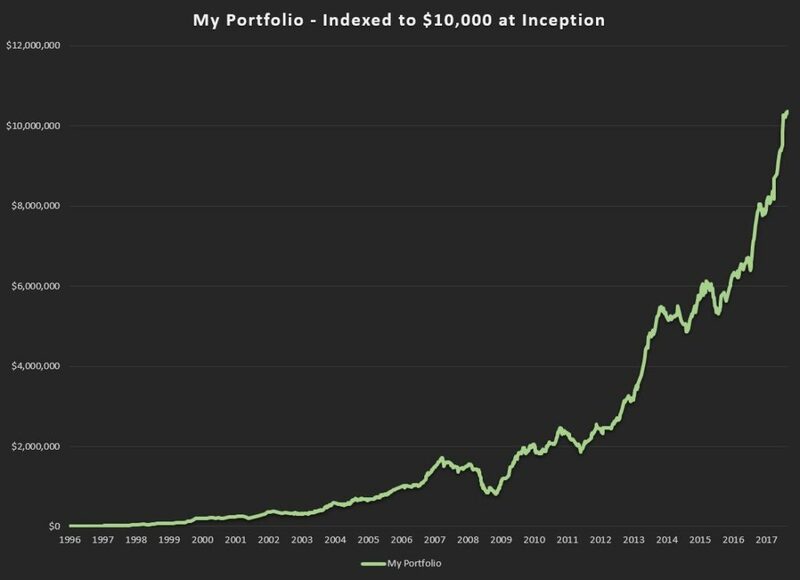 From its inception in the Spring of 1996 up to the end of 2017, my portfolio grew at the fairly astonishing rate of 38% a year. That’s enough to essentially double your money every 2 years. If my portfolio had been a mutual fund and an investor had put in $10,000 at the beginning of that run and had had the restraint not to take any money out along the way (sadly, I haven’t been able to show the same restraint) they would have seen their money grow to just over $10 million 21 years later. I’ve beaten the market, often by a wide margin, in 17 of those 21 years. This kind of track record outperforms every listed mutual fund in existence (as far as I know) and trounces almost every hedge fund as well. But those numbers don’t tell the whole story. Whenever you graph an exponential function on a regular chart, it can end up looking like a rocket ship taking off, especially if the annual gains are quite high. This is the magic of compounding interest. At the beginning of the graph above, a 100% rise barely registers, as $10 000 turns into $20 000. But by the end of the series, a 100% gain takes you from $5 million to $10 million. A better way to visualize what’s going on, in percentage terms, is to draw the same graph using a logarithmic scale, which makes equal percentage moves show up as equal vertical changes on the graph. Using this kind of scale makes a 100% increase look the same, regardless of whether it be from a $10 000 starting point or a $5 million one. Here is my same performance graph, plotted on a logarithmic scale. This picture tells a somewhat different story. As you can see from the graph above, my investing career started off with a bang. Those first 4 years, from 1996 to the peak of the internet bubble were a great time to be an investor. The economy was strong and there were scores of small, rapidly growing, profitable companies to choose from. People were quitting their jobs to become day traders, spending their days glued to their screens chasing each other into and out of the hot stock of the moment. While their activities mostly centered on the technology sector, their enthusiasm bubbled over from time to time into my overlooked corner of the market. Back in those days, my portfolio was very small. I was nimble and highly concentrated in a handful of stocks. Distracted by promises of internet riches, investors were ignoring vast swathes of the market. As a result, there were plenty of exciting “old economy” companies whose stocks were trading at very reasonable prices. Frozen yogurt, call center software, dollar stores, surveillance cameras, home exercise equipment. I was finding lots of opportunities and the portfolio grew very quickly. A couple of big home runs (Bowflex, I’m looking at you) certainly did not hurt either. By the time the market peaked in the winter of 2000, my portfolio had matured. I was more diversified and the portfolio was larger. Thanks to the windfall profits from the late 90s boom, I had managed to grow enough of a nest egg that I could afford to say goodbye to the daily grind and let my portfolio do the heavy lifting for me. Here is my same performance graph, but this time I’ve started it from the peak of the market in early 2000. Looking back at my long-term track record, clearly it seems to make more sense to track my performance starting from the end of those first 4 manic years. Over time, as my portfolio has grown, my returns have moderated somewhat. The reality is that the bigger stocks just don’t give the same snap, crackle and pop that the smaller guys do. Over the years my returns have been fairly consistent. While I’ve had the occasional bigger success, most of my gains have come from a steady stream of 2 or maybe 3 baggers (stocks that double or triple in price). I’ve run a concentrated portfolio by mutual fund standards but not so concentrated that one investment could make or break the portfolio. I’ll typically own between 10 and 15 stocks in a variety of industries and not infrequently from a variety of countries (although at the moment I’m holed up safe and sound on my home turf in the Canadian markets). I gravitate towards small cap stocks but as the portfolio has grown I find myself moving more into the mid and even large cap end of the spectrum. When smoothed out over 17 years, the ride looks reassuringly placid but along the way it has felt anything but. The gut wrenching drop in the fall of 2008 will certainly stay etched in my memory. The speed with which prices fell was breathtaking. 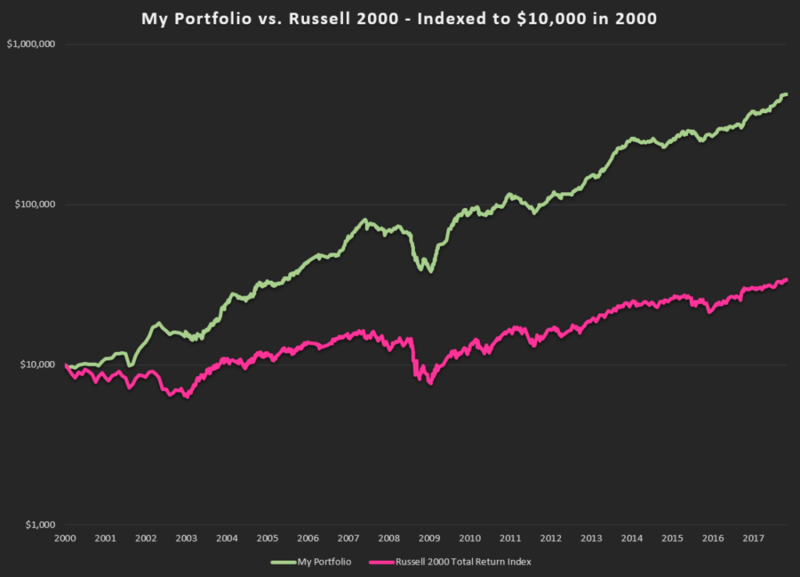 As an important aside, since we are talking here about track records, from its peak in the summer of 2007 to its trough in the winter of 2009, the Russell 2000 TR index dropped by 53%. My portfolio dropped by 52.5%. That extra half a percent was not overly reassuring at the time. But as the market was hitting bottom I was aggressively rebalancing the portfolio, selling the more defensive stocks I owned and buying beaten down companies that I thought had the wherewithal to weather the storm and were selling for 2 or 3 times their earnings of the year before. 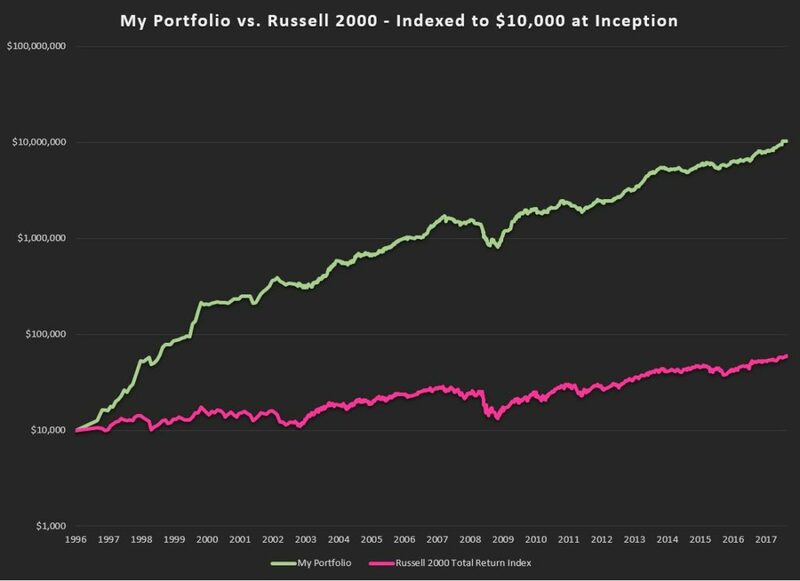 This strategy worked like a charm and the portfolio powered higher by 107% in 2009 as the market recovered. Apart from the recent foray into a possibly misguided hedging strategy involving the purchase of S&P 500 put options and a flirtation with a fund that sells stocks short (betting that they’ll go down), my portfolio has always been made up entirely of a basket of hand-picked, undervalued, mostly small cap stocks. Canada is my home market and has always been the core of the portfolio, but I’ve ventured abroad at times, investing in Hong Kong, the UK and, of course, the US. Through those exchanges I’ve even owned companies that were even more far flung. An unfortunate purchase of a Ukrainian egg farming company, just before hostilities broke out in that country, springs to mind. I’ve loved the thrill of discovering hidden value in all the far-flung corners of the market. From lighting fixtures to industrial abrasives. From struggling clothing retailers to software resellers. From lumber distributors to vaccines for fish farming. If it’s cheap, I’ll buy it. I don’t trade that often. In any given year I might buy a handful of new stocks and sell a handful of older ones. I’ll often hold stocks for a year or two or three at a time. I’m in no rush. When I find a good value, I’ll stick with it until eventually the rest of the market sees what I see. It doesn’t always happen, but it happens often enough that it keeps the lights on. Past performance is no guarantee of future results. Despite the bursting of the internet bubble, the gut wrenching decline of 2008 and the sluggish economic recovery since then, for small cap investors the wind has basically been at our backs for the last 21 years. That wind will change direction at some point and it remains to be seen how a disciplined, bottom up, value-oriented approach like mine will fare in that circumstance. I invite you to join me on this journey and together we will see what the future might have in store!